Breakfast: Mon– Fri 7am–10.30am, Sat & Sun 7am – 11am. L Sun only, 1-3:pm; €45pp/children under 12 years, €19.50 D:Tue-Sat:6.30-9.30pm. 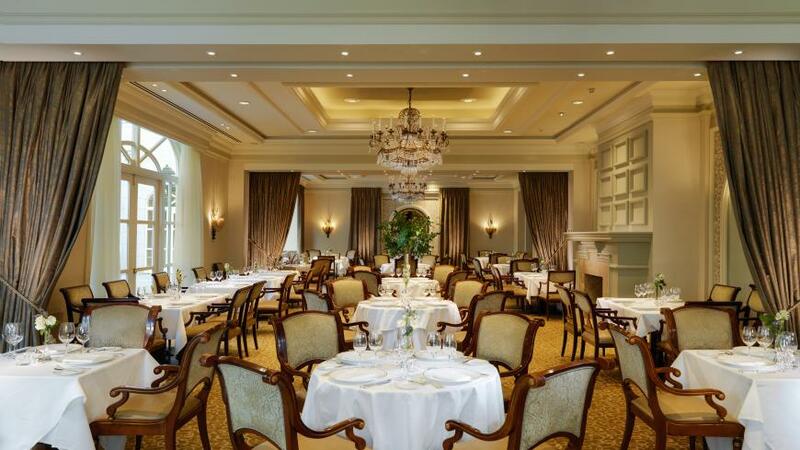 Lunch and Dinner Menu available in The Reading Room & The Lobby Lounge. Air conditioning. Amex, Diners, MasterCard, Visa. 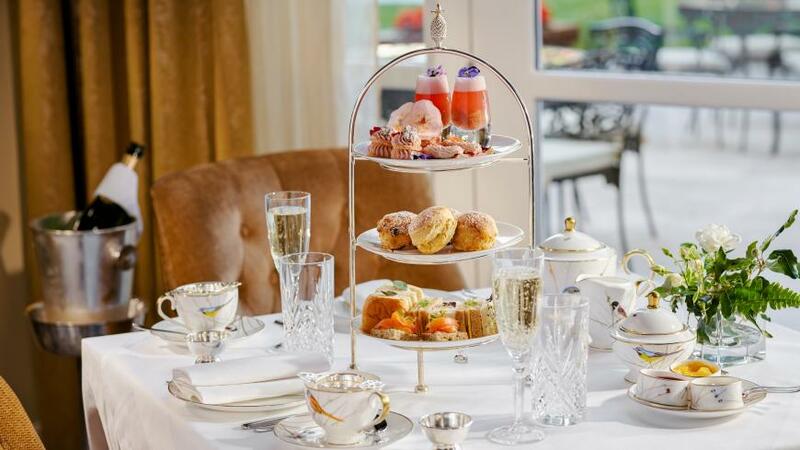 Formerly the Four Seasons, this luxurious Dublin hotels on a magnificent site, set in its own gardens on a section of the Royal Dublin Society's 42-acre show grounds. 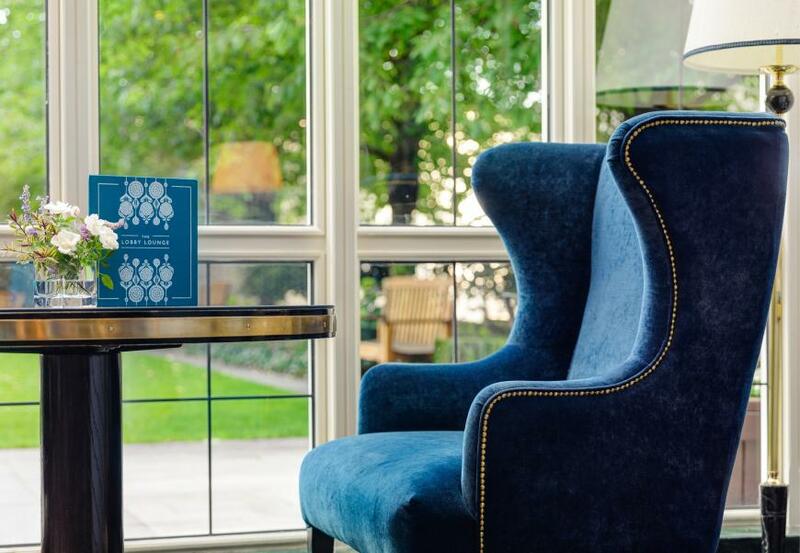 This allows an exceptional sense of spaciousness while also being convenient to the city centre - the scale is generous throughout and there are views of the Wicklow Mountains or Dublin Bay from many of the sumptuous suites and guest rooms. 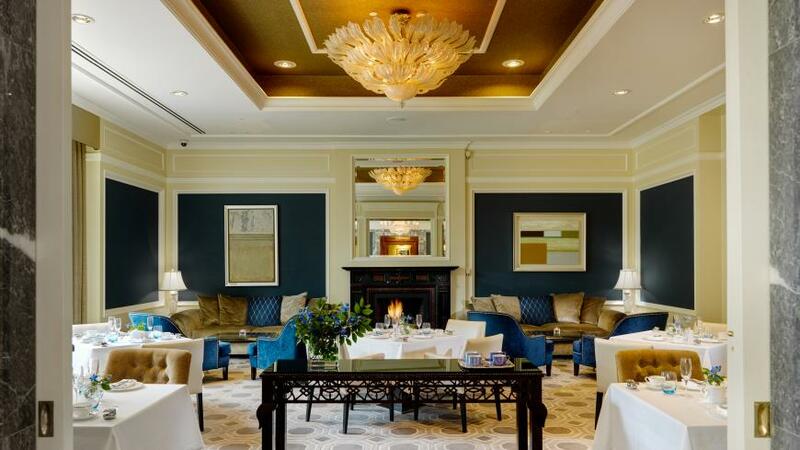 The Foyer, The Lobby Lounge, The Bar and The Reading Room have been recently restyled and retained their names with the change of ownership; together with the deliciously contemporary ICE Bar, which is very popular with Dubliners, the feel is casual-sophisticated and offers a warm welcome. Accommodation is predictably luxurious and, with a full range of up-to-the-minute amenities, the air-conditioned rooms are designed to appeal equally to leisure and business guests. A choice of pillows (down and non-allergenic foam) is provided as standard, the large marbled bathrooms have separate bath and shower, and many other desirable features - and there's great emphasis on service, with twice daily housekeeping service, overnight laundry and dry cleaning, one hour pressing and complimentary overnight shoe shine: everything, in short, that the immaculate traveller requires. But the Spa in the lower level of the hotel is perhaps its most outstanding feature, offering every treatment imaginable - and a naturally lit 14m lap pool and adjacent jacuzzi pool, overlooking an outdoor sunken garden. It is the only Spa in Dublin to offer separate sauna and steam room facilities for men and women. There is also a state-of-the-art gym with Personal Trainer and Nutritionist available for day guests, residents as well as members. Outstanding conference and meeting facilities make the hotel ideal for corporate events, business meetings and parties in groups of anything up to 550. Conferences/Banqueting (550/450), business centre, secretarial services, video conferencing (on request), broadband wi/fi. Children welcome (under 18s free in parents' room, cot available free of charge, baby sitting arranged). Rooms 197 (1 Presidential Suite, 10 Deluxe Suites, 3 Speciality Suites, 26 Executive Suites,18 Junior Suites, 3 Family Suites,13 for disabled. No smoking. 24 hr room service, Lift. Turndown service. Room rate from about €190 (max 3 guests). Children welcome. Small pets permitted by arrangement (complimentary). Open all year. 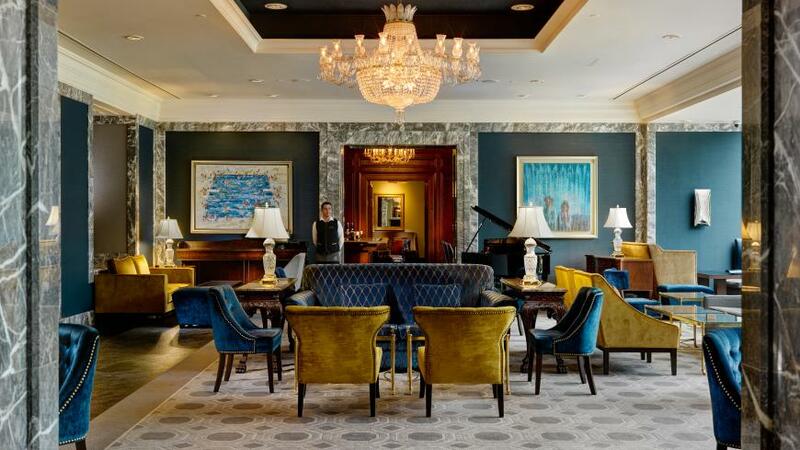 Seasons Restaurant: Just through the plush foyer is the light-filled Lobby Lounge, the perfect place to enjoy a leisurely pre-prandial and acclimatise to the opulent surroundings and the soothing pace of this well-oiled five-star machine. Appetite suitably whetted, make your way through to Seasons Restaurant where the high-ceilinged room oozes comfort and opulence. Crisp linen tablecloths and gleaming glassware set the tone, with large bay windows making the most of the view out into the courtyard garden. The key feeling here is one of space; the generous tables are perfectly spaced so that you’re not nose to tail with your neighbour, but can still hear the pleasant background hum of fellow diners. Comfortably upholstered chairs add the essential finishing touch to reinforce the feeling that a meal here is something to be savoured and lingered over. The wine list, curated by resident sommelier Stéphane Reynard, is well laid out and easy to navigate with wines categorised by style rather than region, inviting you to choose whites from the “Crisp & Clean” or “Citrusy & Mineral” list etc, with prices, per bottle, from €36 to sky high, in keeping with the five-star status of the hotel. On the menu, Executive Chef Alberto Rossi (an integral part of the culinary team since its Four Seasons days) declares a mission to “spotlight Irish artisan suppliers” and work with “high quality, locally grown produce to deliver classic style Irish cooking.” And that is a promise the meal delivers on. His nicely curated choice of six starters might offer familiar favourites such as St Tola goat’s cheese mousse with beetroot crumb (€9), alongside the more adventurous offering of Harty oysters with crunchy pork skin and lime crystals (€11) or a deliciously simple dish of seared scallops and Dublin bay prawns (€12). Mains follow suit – maybe an elegant plate of crispy Skeaghanore duck with sweet carrot purée, foie gras and orange jus (€24), a tasty vegetarian stack of chargrilled aubergine and halloumi cheese with a colourful barley salad (€18) or smoked in season mackerel with brown crab mayonnaise and seaweed gnocchi (€22). The cooking here is competent and assured with little in the way of surprises. Desserts, while not the highlight, provide an elegant-looking end-note to a leisurely meal. And if you feel the call for a post-prandial, the next door Whiskey Bar offers a cosy, clubby space to retreat to, to indulge in something golden and delicious from over 100 Irish whiskey labels. Seats 90 (private room, 12). Breakfast: Mon-Fri 7am-10.30am, Sat & Sun 7-11am. L Sun only, 1-3:pm; €45pp/children under 12 years, €19.50 D:Tue-Sat:6.30-9.30pm. 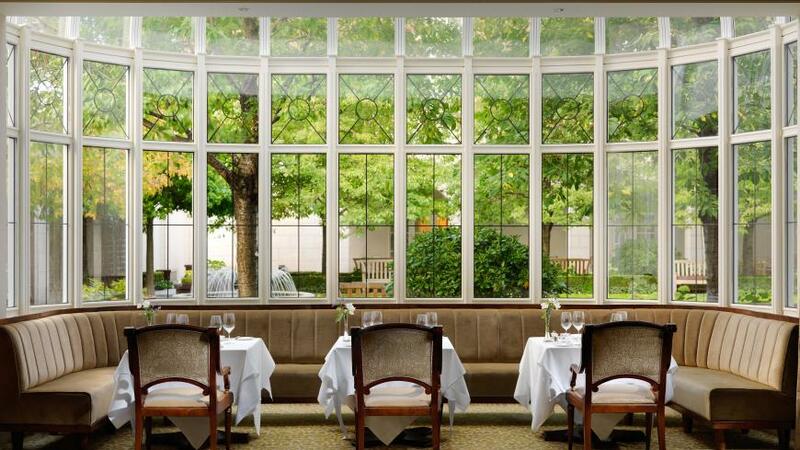 Lunch and Dinner Menus available in The Reading Room & The Lobby Lounge. Located on the RDS Grounds on corner of Merrion and Simmonscourt Roads.